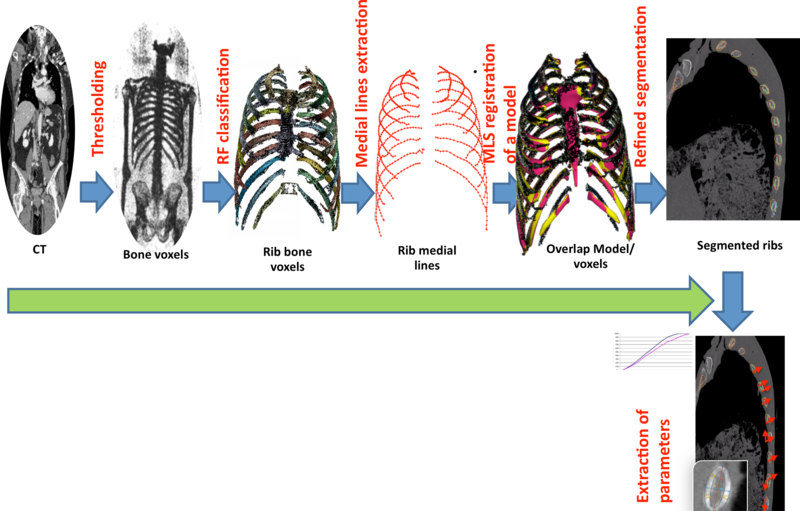 This project aims to finely segment rib bones on a large heterogeneous databases of CT-images from patients and cadavers, toward the construction of numerical models of the human skeletons for car manufacture. This project is in collaboration with the LAB of Renault. Characterization of pathological process evolution in brain images. This project focuses on the direct comparison of longitudinal MRI data sets via non-linear equalization of their histogram with Midway mapping and statistical analysis of significant differences. 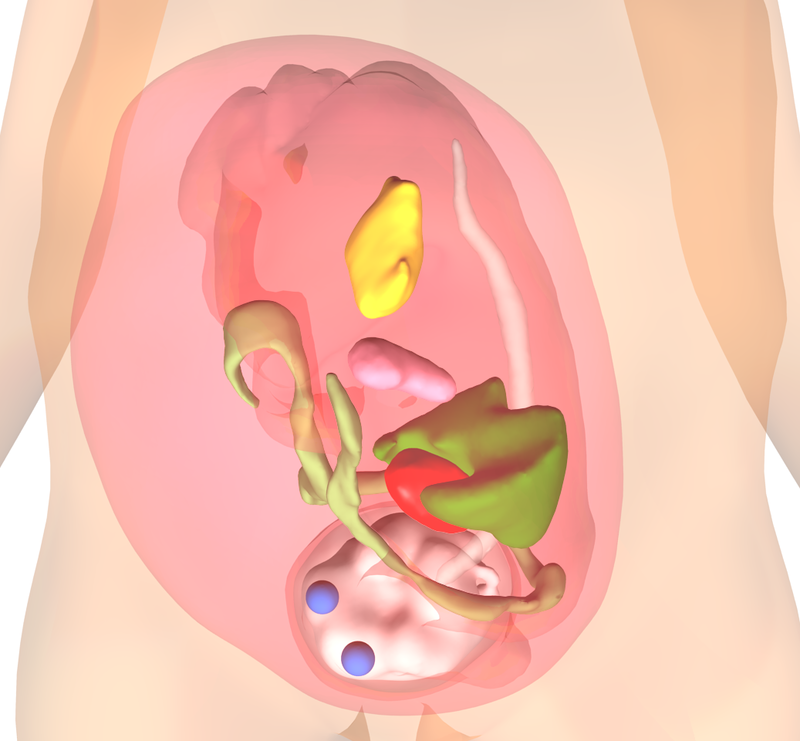 This project focuses on generation of accurate and rich anatomical models of pregnant women from MRI and 3DUS segmentation of fetal structures and computer graphics tools for the modeling of the maternal envelope. This project is performed in collaboration with G. Grangé (Hopital Port Royal, France) and C. Adamsbaum (Hopital Kremlin Bicetre, France). This project uses the open-source SOFA physics-based modeling framework. All models a distributed freely to the scientific community. Hierarchical Graphs for Anatomical and Funtional Representations of the Human Anatomy with Pathologies: Application in Oncological neurology. This project is interested in the development of computational tools for medical practice support. 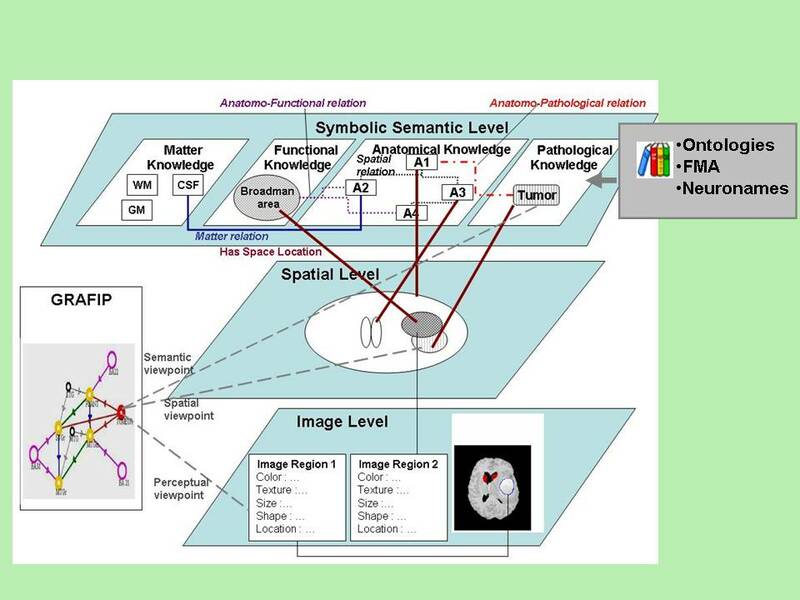 The two approaches focus on information processing and knowledge representation for medical image interpretation. 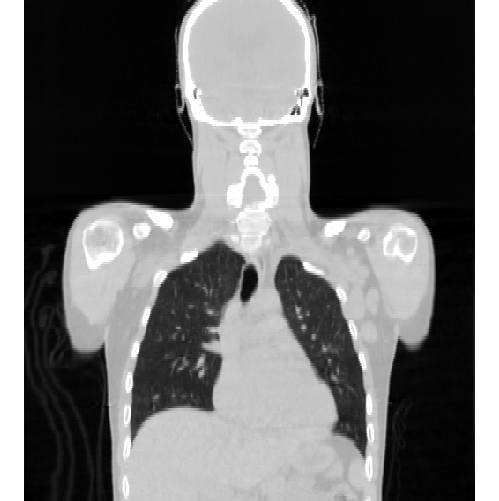 A methodology and software tools are developed with the aim of managing an electronic patient record after the extraction, integration and manipulation of patient’s information via segmentation of anatomical structures on 3D medical images. 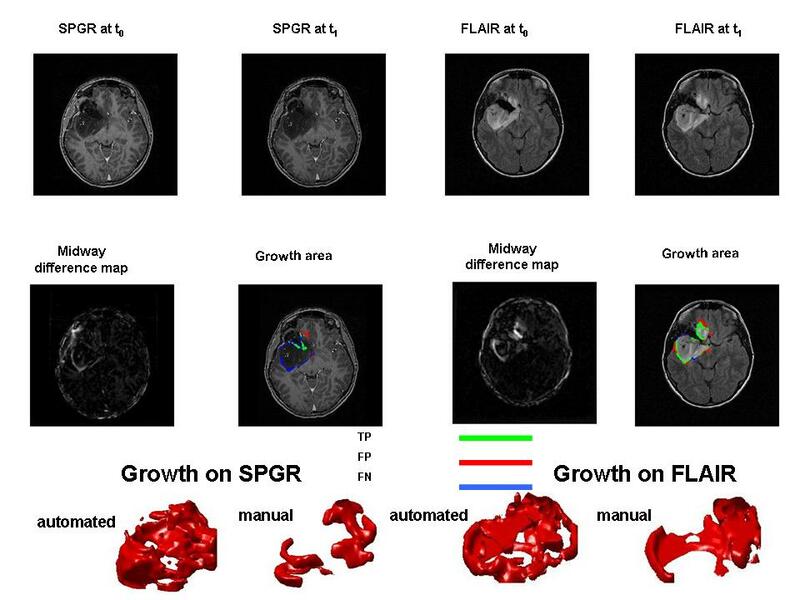 In this project, the clinical application deal with the documentation and treatment planning of brain tumors in neurology, based on magnetic resonance images (MRI) of the brain for several types of tumors. This project is interested in the extraction of deformation metrics from RT3D ultrasound data of the LV. Experiments on disease patients and dog studies have been performed, showing high sensitivity of the method to identify abnormal wall motion. Current developments of the project include comparison to Taggued MRI data. This project is interested in the application of the multiphase Chan-Vese segmentation framework to brain MRI to extract white matter, gray matter and CSF tissues in a fully automated fashion. A study was publised in "E. Angelini, T. Song, B. Mensh, and A. Laine, Brain MRI Segmentation with Multiphase Minimal Partitioning: A Comparative Study, International Journal of Biomedical Imaging, Vol. 2007, Article ID 10526, 2007 (open access). 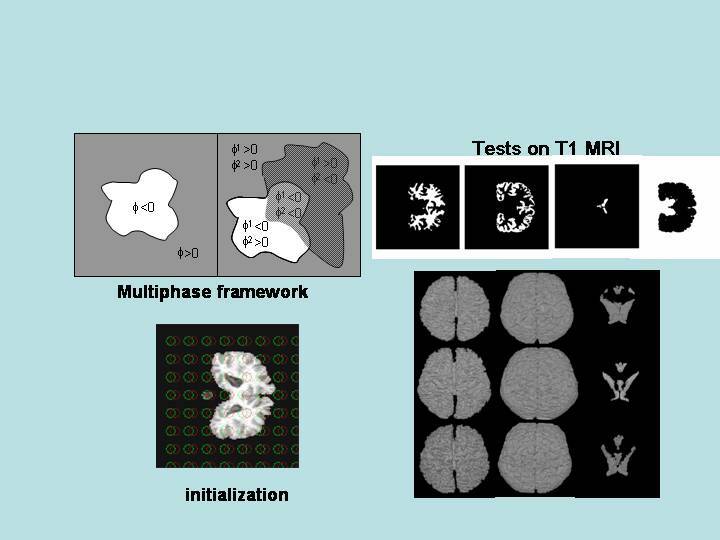 Current developments for this project include the extension of the segmentation frmaework to vectorial data, combining T1 and T2 MRI images, the application to disease cases and the design of new homogeneity measures, more discreminant. 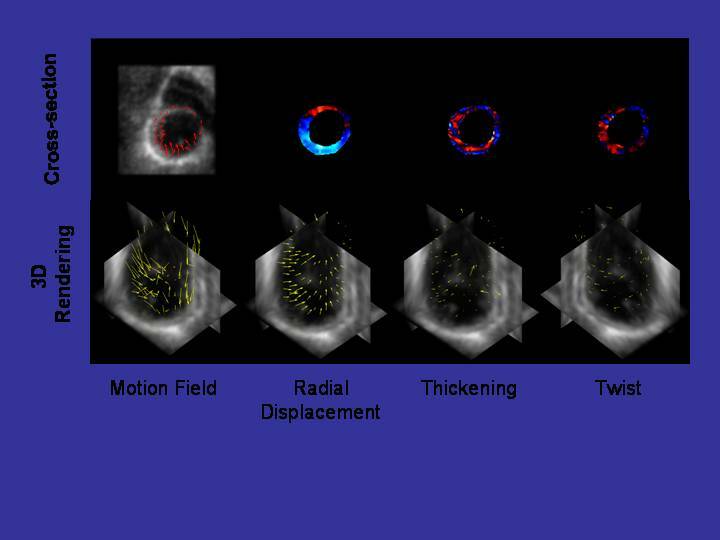 The long-term goal of this research project is to design and validate a method of dynamic analysis for recently developed real-time three dimensional (RT3D) ultrasound technology that would provide cardiologists with a new diagnostic instrument to accurately measure cardiac function. 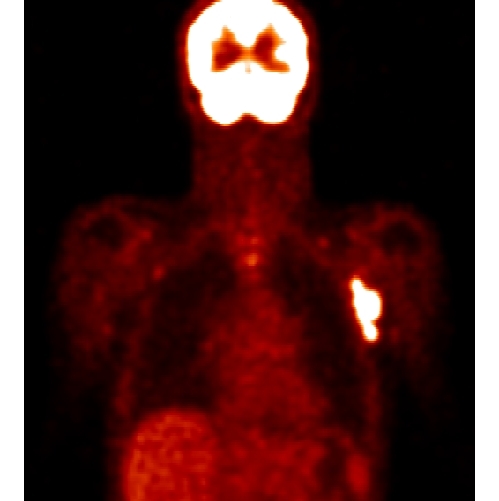 The proposed development would make available a portable and low cost system which would be easy to administer and less invasive than existing 3D protocols including high-speed CT, phase contrast and tagged MRI, and equivalent (and in some cases superior) to the current “gold standards” for assessing cardiac function, for example measures of ejection fraction via MUGA. We have developed a new method of denoising and contrast enhancement of cardiac echos tailored to the characteristics of RT3D ultrasound, as described here. The proposed integration of the time dimension within this process is quite innovative in terms of engineering. Existing methods for segmenting 3D static organs or 2D dynamic echocardiography are based on physical assumptions that are not compatibly with RT3D ultrasound aquisition. Time is essential to describe the deformation of the cardiac wall and in the physics of acquisition in the transducer. The proposed research will demonstrate that by including the time dimension in the denoising/enhancement process we can dramatically improve the quality and robustness of clinical measures of importance to access quantitative cardiac function. Brushlet functions were introduced in 1997 by Fran çois Meyer and Ronald Coifman for the compression of textured images. Brushlet functions decompose a signal along oriented textural patterns ("brush strokes") at specific orientation and resolution. They offer an orthogonal analysis framework and decompose a single frequency in one coefficient. They also provide a complete arbitrary tiling of the Fourier plane. These properties make such complex analysis functions superior to Wavelet packets and Gabor functions in terms of analysis compactness and flexibility. 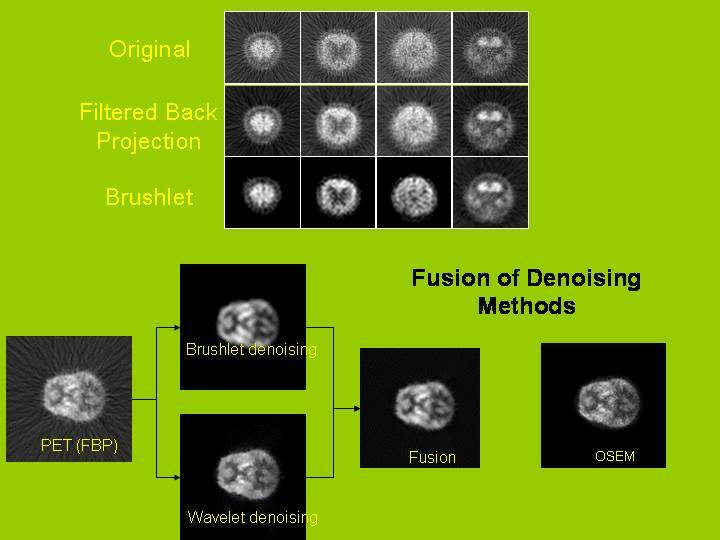 We are interested in studying the quality of denoising of various "textured" medical signals via thresholding of brushlet expansion. 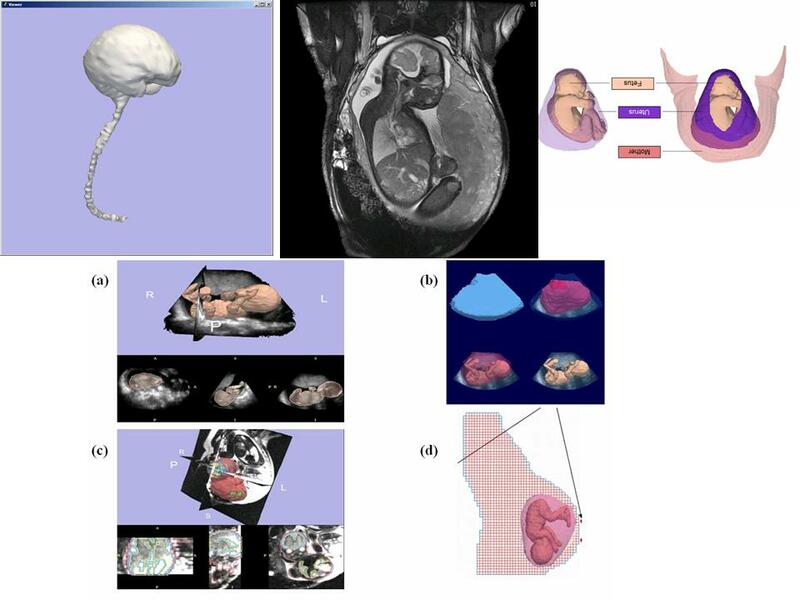 Application to multidimensional textured medical images such as 3D Ultrasound, PET brain scans and MR spectroscopy. This project was part of the Visible Human Project for the development of the ITK toolkit sponsored by the National Library of Medicine. 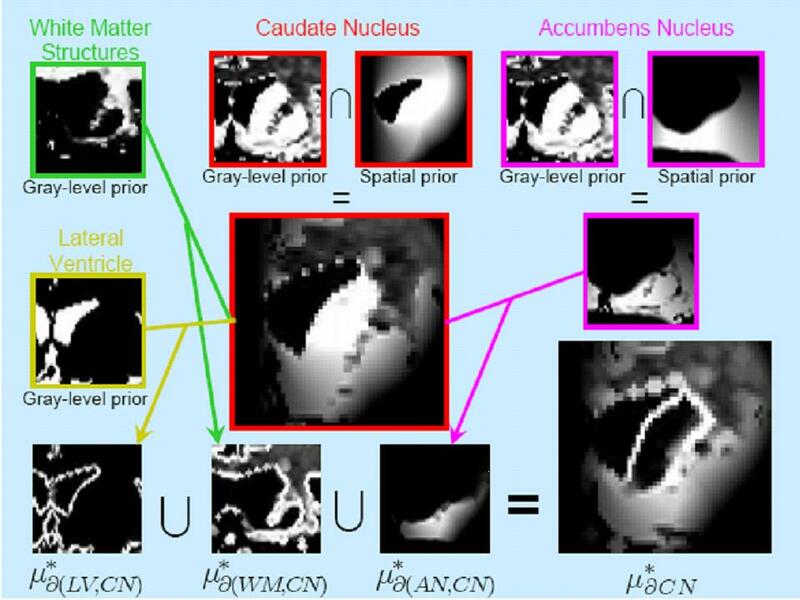 We are interested in combining multiscale-relative fuzzy connectedness, Voronoi diagram classification and three dimensional deformable model for the segmentation of high-resolution multi-channel images. 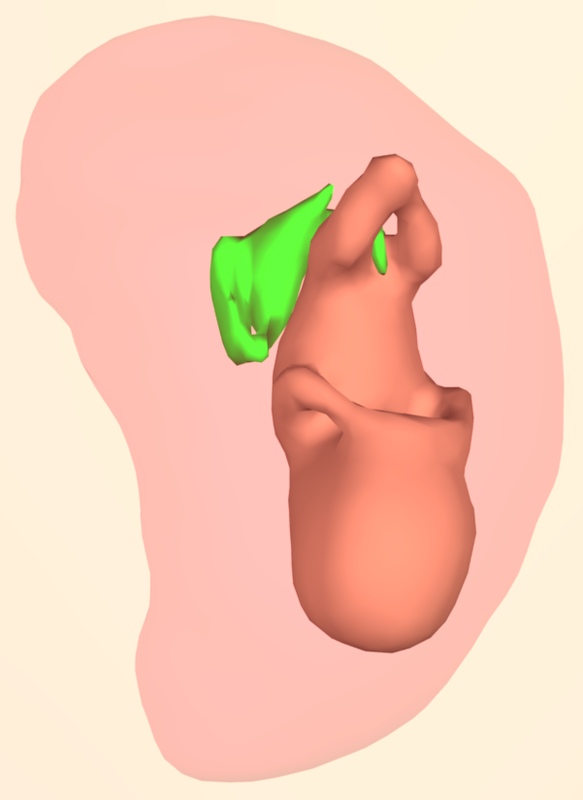 The hybrid segmentation scheme structure combines: (1) Multiscale relative fuzzy connectedness for extraction of region of interest and texture statistics within the object (2) Voronoi diagram classification using the statistics extracted inside the object (3) Three-dimensional deformable model to smooth the extracted contours and extract 3D object surfaces out of Voronoi classified cells. We have tested the hybrid segmentation method on color data from the Visible human data sets and on other multi modality medical images such as (T1-PD) registered MRI and cryogenic sections and we have shown the superiority of the hybrid method over single ones. Segmentation results are more robust and accurate and require limited user intervention with manual initialization of seed points inside the object to segment. Statistical Segmentation of knee cartilage using KL classification (1997-1998). Time-Frequency analysis of Electromyography (EMG) signals for diagnosis of Carpal Tunnel Syndrome (1996).